The capital of Spain that doesn’t take itself too seriously. All roads in Spain lead here and more specifically, to the Puerta del Sol, the physical and emotional heart of the city. We had an awesome train trip from Barcelona to Madrid after a small problem. All the websites seemed to indicate that reservations were not required however when we got to the platform we were told we needed one. So I raced back up to the ticket office got our reservations and made it back to the platform in time for the train. The train was awesome – we were served the best and unexpected breakfast. It was so cute – the little salt & pepper, olive oil, marmalade, eggs, fruit and real knives and forks. We also collected a souvenir – knife, fork and spoon with Spanish train company emblem and all – hey when they give two sets what else is a girl meant to think !!! 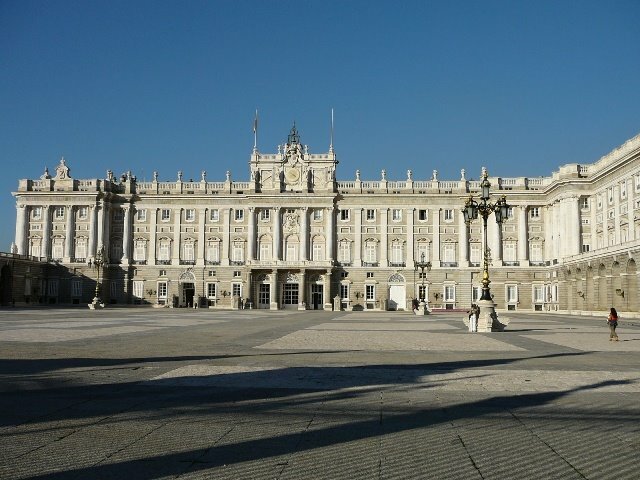 Palacio Real, 18th century royal palace is a showpiece of what happens when interior decorators are let loose, it hasn’t been used as a royal residence for some time. Next door the Catedral de Nuestra Senora de la Almudena, and behind the sprawling Campo del Moro, a pretty park.